Do you have old dingy mouldings that have been painted so many times that you aren't sure where the moulding stops and the wall begins? Well, if you live in a really old house you might find that characteristic of your house charming, but if you are like me, you would rather update the mouldings for a fresh and clean new look. 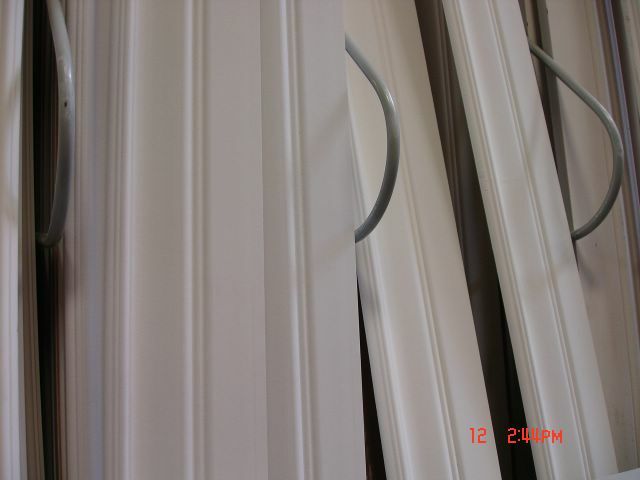 Replacing your mouldings is not that hard, it's more time consuming than anything. But hey, most home improvement projects are, right? I've done a single room with just a handsaw and box, but I would recommend purchasing a miter saw if you plan on doing any more than one room because it can get to be a little much. The tools you will need to change your mouldings are: an exacto knife, moulding of your choice at least as tall as the existing moulding, trim paint and roller or brush (I recommend at least a semi-gloss because it is much easier to clean), handsaw with miter box or electric miter saw, crow bar, tape measure, pencil, finish nails, and caulk (honestly, caulk is my best home improvement bud - it will make any job you do look professional). I know this seems like a lot of tools, but you probably have most of them already in your garage. The biggest expense will be the moulding, but it is fairly inexpensive as long as you install it yourself. The first step is to take your exacto knife and cut along the top of the moulding as deeply as you can. What this does is separate the moulding from the wall. If you skip this step you may run into many more projects you didn't want to do because part of the wall will come off as you pull off the existing moulding. Once you get the moulding off, measure the length needed for the new moulding by going from wall to wall. 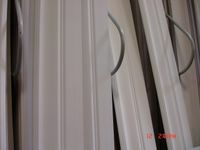 Make sure you cut your inside corners at a 45 degree angle so the longest part is at the back of the moulding. for inside corners, make your cut go out so the angle sticks out further than your measurement. Once you get it cut the right length, use finish nails to anchor it to the wall. Repeat this step for each wall. To finish everything off, caulk the gap between the wall and the moulding and use touch up paint anywhere that got dinged while you were working with the moulding. For more information or more great advice for you next home improvement project, check out this home improvement site. If you've gotten stuck on a project, get advice from an experienced carpenter in this home improvement forum. I did a search for gas mileage and found this site. I have put together an ebook I have titled, "Huge Gas Pump Savings." Wonderful blog, I really like it! keep up the good work in what ever you go for. What's in your ##family## immediate future? Hi there Brooke, a real useful blog. Can you believe it? When blog surfing for detailed info on wood working joint I ended up on your page. Obviously your site is not exactly what I was searching for, but your site caught my interest. Just wanted to drop a quick note to comment your blog...now to move on and continue my search for wood working joint. Should the need ever arise where you need information on wood working joint then drop by for a look. Hi Brooke, you have a nice blog. Glad to see it. Today I was out blog surfing looking for detailed info on canadian wood working when I found your page. Your site describing Home Improvement Project: Upgrading your Mouldings is not an exact match but it did catch my interest. I am going to add you to my favorite list of blogs for future reading and reference. Should you ever need information on canadian wood working then drop by the site above and check it out. Hi Brooke, your blog is excellent. As I was surfing around today looking for detailed info on wood working project for kid I somehow ended up on your page. As your Home Improvement Project: Upgrading your Mouldings is not exactly related to my search, I am certainly glad I stopped by. Oh well, back to surfing and I am sure I will find what I am looking for, and should you ever need information about wood working project for kid, then stop by for a look. Thanks for the post. Hi Brooke, your blog is excellent. As I was surfing around today looking for detailed info on power sander tool wood working I somehow ended up on your page. As your Home Improvement Project: Upgrading your Mouldings is not exactly related to my search, I am certainly glad I stopped by. Oh well, back to surfing and I am sure I will find what I am looking for, and should you ever need information about power sander tool wood working, then stop by for a look. Thanks for the post. bookmark your site for future reference and reading. Should you ever need it, you can get specific information about wood working shop layout at the site above. Hi Brooke, I found your blog informative. While out blog surfing today for specific info on wood working shop layout, I ended up on your page. Your site shows that I ended up a little off base, but I am certainly glad I stopped by. I will bookmark your site for a future visit, and should you ever need it, there is plenty of information on this site about wood working shop layout. Hi Brooke, you have a nice blog. Glad to see it. Today I was out blog surfing looking for detailed info on jet wood working tool when I found your page. Your site describing Home Improvement Project: Upgrading your Mouldings is not an exact match but it did catch my interest. I am going to add you to my favorite list of blogs for future reading and reference. Should you ever need information on jet wood working tool then drop by the site above and check it out. Hi, Als je bij de bank niet slaagt om te lenen, heeft men bij online lenen dan nog wel kans op succes? Sure have alot of info here, I really like your site. I will probably visit here again. Have a great life. ##webdesign## It is all about##yourfuture## having your own website. Come and visit if you like. Hi Brooke, I found your blog informative. While out blog surfing today for specific info on free wood working catalog, I ended up on your page. Your site shows that I ended up a little off base, but I am certainly glad I stopped by. I will bookmark your site for a future visit, and should you ever need it, there is plenty of information on this site about free wood working catalog. bookmark your site for future reference and reading. Should you ever need it, you can get specific information about wood working project plan at the site above. bookmark your site for future reference and reading. Should you ever need it, you can get specific information about wood working machinery auction at the site above. You have done a good job here with your blog. I really enjoyed looking at it. there to see, until you see a blog like yours. Looks good! Keep it up! ##independence## it may be of##Future## interest to you. If you find the time.